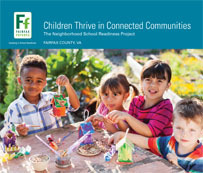 Fairfax Futures released a new publication, Children Thrive in Connected Communities, highlighting the work of the Neighborhood School Readiness Project. The booklet, and its complementary video, highlight how community-based partnerships can support young children's successful transition to school. The booklet and video were made possible through a grant from the Washington Area Women’s Foundation Early Care and Education Collaborative. Download your copy of the publication. Download Children Thrive in Connected Communities here.